There have been two major waves of fantasy movies. The latest (and most would argue, the most successful) began in the late 1990s with the releases of The Fellowship of the Ring and Harry Potter and the Sorcerer’s Stone. The earlier one occurred during the 1980s and, despite a few modest successes, never caught fire. At the time, this baffled some analysts. After all, fantasy’s “big brother,” science fiction, was all the rage. In retrospect, the problem with ‘80s fantasy is evident: it was too childish. While this made nearly everything (except outliers like Conan the Barbarian) acceptable for family viewing, it turned off many hard-core fantasy-lovers. If words like “cute” and “cuddly” were being used to describe a fantasy film, chances are that those who read fantasy novels and played D&D weren’t interested and, without the passion such viewers brought to the genre, it’s no surprise the genre floundered. Case in point: 1988’s Willow. Considering the talent involved – George Lucas as the main storyteller and executive producer, Ron Howard in the director’s chair, and ILM’s top special effects team – Willow should have been more successful than it was. Unfortunately, it was “cute”, “cuddly”, and sadly lacking in anything new or especially exciting. Although by no means unwatchable, it feels closer to Return of the Jedi than Star Wars on the Lucas spectrum. The fantasy aspects are more obviously derivative than those of Star Wars, perhaps because they aren’t as well-massaged. 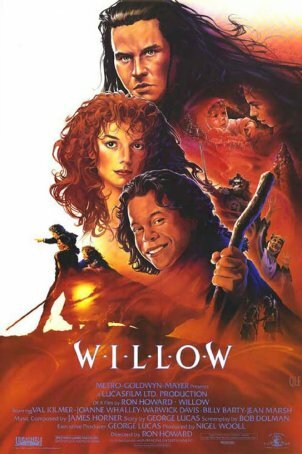 Willow is dumbed-down King Arthur crossed with The Hobbit with more than a dash of Star Wars thrown in. With its thinly-drawn characters and somewhat aimless narrative, the film rightfully failed to capture a die-hard audience or launch the hoped-for franchise. Those who saw it in May 1988 were generally unimpressed. Those who see it today, in the wake of the far better fantasy releases of the last two decades, are likely to be downright disappointed. The film transpires in a generic fantasy world populated by typical fantasy races like humans, dwarves, fairies, and trolls. The chief villain is Queen Bavmorda (Jean Marsh at her scene-chewing best), who takes her inspiration from every evil ruler in Disney’s animated oeuvre. There’s a prophesy involved, because what would ‘80s fantasy be without a prophesy? It states that a female child with a birthmark will grow up to end the queen’s reign. With a Herod-like determination for this not to happen, Bavmorda determines that all newborns must be screened. When the baby Elora Danan slips through her fingers, courtesy of a compassionate midwife, Bavmorda sends her chief general, Kael (Pat Roach), and her warrior daughter, Sorsha (Joanne Whalley), to retrieve the child so she can be used in a ritual that will ensure Bavmorda’s continued preeminence. After floating down a river Moses-like, Elora ends up at the Hobbiton-inspired village of Nelwyn, which is inhabited exclusively by dwarves. Kaiya Ufgood (Julie Peters), the wife of would-be sorcerer Willow Ufgood (Warwick Davis, getting an upgrade from his previous role as an Ewok), comes into possession of the baby. Although Willow’s family wants to adopt the little girl, the local wizard, the High Aldwin (Billy Barty), decrees that Elora must be returned to the humans. Accompanied by a group of his fellows, Willow embarks on this quest. The first human he meets is the caged warrior Madmartigan (Val Kilmer), who offers a bargain: if the dwarves free him from the cage, he will care for the child. Ultimately, this doesn’t work out and Willow must travel with Madmartigan to take Elora to the castle of Tir Asleen, where the future of the world will be determined in a battle between Bavmorda’s forces and those of the army seeking to unseat her. One of the most surprising misses of Willow is the poor job done of “world-building.” This fantasy realm consists of two cities, a village, and a lot of generic in-between terrain. There’s nothing special or distinctive about the world and the armies that clash in the main conflict seem woefully undermanned. Contrast this to the battles in The Lord of the Rings, The Hobbit, or Game of Thrones. Willow provides a few creatures, although most of them are on hand because this is a fantasy movie and fantasy movies are expected to feature monsters. The trolls look like Planet of the Apes refugees. The brownies are a low-rent C3PO and R2D2, on hand more for comic relief than because they add anything important. The two-headed dragon reminds us that these are ‘80s special effects. It is rendered in a similar fashion to Return of the Jedi’s rancor. The score, composed by James Horner during the most active portion of his career, owes more than a passing debt to John Williams. Of course, this being ‘80s Horner, there are echoes of the music from everything from Star Trek II to Aliens woven throughout. For anyone familiar with those soundtracks, it can be distracting. This was Ron Howard’s first collaboration with Lucasfilm. He would return 30 years later in a vain attempt to rescue Solo from oblivion – a task that proved to be too much for him. In 1987, Howard (who had acted for Lucas in American Graffiti), was picked based on his success with Cocoon. Willow, although not a commercial blockbuster, increased Howard’s stock and allowed him to step up to the high-profile projects that would eventually earn him an Oscar and catapult him onto Hollywood’s A-list. The acting is adequate – good enough for fantasy-adventure but not many Lucas films are going to win awards in this department. Warwick Davis is okay and Lucas deserves credit for diversity – every dwarf is played by a genuine “little person” (apparently, the Munchkins in The Wizard of Oz were the inspiration). Val Kilmer is pretty awful but he and future-wife Joanne Whalley enjoy solid chemistry. Jean Marsh froths at the mouth and shrieks a lot but refrains from asking any mirrors about her being the fairest of them all. Willow feels like the kind of movie that might have worked considerably better on the printed page. Many great fantasy stories start with generic settings and move forward relying on genre tropes. The magic (no pun intended) is in the details and the way the characters and terrain are allowed to come to life and breathe. Everything in Willow is so perfunctory and rushed that nothing evolves or develops. The pacing is relentless yet, in the end, not much seems to have been achieved. The film is engaging in a limited, distracted way. One doesn’t have to pay a lot of attention to understand what’s going on. It’s a perfect example of ‘80s fantasy in every way – targeted toward children, unremarkable (except in its cinematography and some of the visual effects), and ultimately disappointing. If Lucas’ intention (as was stated at the time) was for Willow to do for fantasy what Star Wars had done for space opera, the result wasn’t there. Star Wars has become one of the greatest franchises of all time; Willow, if it’s remembered at all, is dimly recalled as having been quaint, cute, and cuddly.